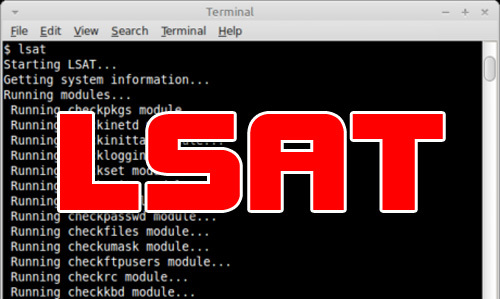 Linux Security Auditing Tool (LSAT) is a post install security auditing tool. It is modular in design, so new features can be added quickly. It checks inetd entries and scans for unneeded RPM packages. It is being expanded to work with Linux distributions other than Red Hat, and checks for kernel versions. It (for now) works under Linux (x86: Gentoo, RedHat, Debian, Mandrake; Sparc: SunOS (2.x), Redhat sparc, Mandrake Sparc; Apple OS X). checkbp: Checks for boot loader password. checkdotfiles: Looks for .forward, .exrc, .rhosts and .netrc files on the system. checkfiles: Checks that /tmp and /var/tmp have sitcky bit set, checks utmp, wtmp, motd, mtab for chmod 644.
checkftpusers: Checks that all accounts in /etc/passwd are in /etc/ftpusers. checkinittab: Checks to see if default runlevel is 5. If it is, give the user a warning. checkipv4: Checks to see that common forwarding and ignoring are off/on in ipv4. checklogging: Performs a simple check to see if auth and authpriv logging facilities are on. checkpasswd: Checks /etc/passwd for unneeded accounts. checkpkgs: Checks list of packages (rpms, debs) installed on the system. checkset: Checks system for all setuid/setgid files. checkssh: Check some security features of ssh for instance: root logins, X11 forwarding and the like. checkumask: Checks that the default umask on the system is sensible. checkwrite: Checks system for world writable files. ./lsat [OPTIONS] Options: -d diff current and old md5, output in lsatmd5.diff -f Force a specific distribution test. Distro names are: redhat debian mandrake solaris gentoo macosx If no -f option, lsat will guess. If lsat can not guess the distribution, default is redhat. -a Show this (advanced) help page -o Output file name -- default is lsat.out -r Check rpm integrity -- redhat or mandrake only -s Silent mode -v Verbose output -w Output file in html format -x eXclude module(s) in filelist from checks... modules listed in filename will be excluded from checks. Valid module names are the module names themselves without the check. (e.g. set not checkset) the check. not guess the distribution, default is redhat. names themselves without the check. (e.g. set not checkset) the check. Sourceforge was having some issues last night so it wasn’t always responding with a successful HTTP code, so the link was marked as broken. It should be ok now.